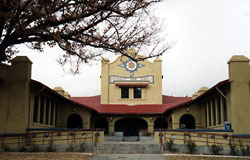 Designed by local architect George Ferris in 1909, the McKinley Park School was one of four Reno schools known as the "Spanish Quartet," single-story Mission Revival style schools built around the turn of the 20th century (see also Mount Rose Elementary School). The schools represent a growth spurt in the city of Reno and were highly praised at the time of their construction for their modern convenience and technology, as well as their potential to serve as community focal points. The use of Mission Revival style has been attributed to the preference of school superintendent at the time, B.D. Billinghurst, who was enamored of Spanish architecture. However, the State Superintendent of Public Instruction reported to the legislature in 1915 that mission architecture was chosen as it "is especially adapted to one-story buildings," and he added "there is nothing better for school purposes than one-story buildings. The one-story plan eliminates the stair climbing so destructive to the nervous strength of pupils and teachers, and also renders danger from fire impossible." McKinley Park School is situated across Riverside Drive from the Truckee River and large trees give the expansive grounds a park-like feel. The stucco-surfaced school is U-shaped with a central open court and an arcade sheltering the main entry. A two-story central tower stands at the base of the U, with a one-story wing extending behind it. The school has undergone rehabilitation and now serves as the City of Reno's Arts and Culture Center, which is open to the public. The rehabilitation effort was supported through grant funds from the National Park Service's Historic Preservation Fund. The McKinley Park School is located at 925 Riverside Dr. in Reno. Call 775-334-2417 for activities and events.